New Rochelle, NY, April 04, 2019 --(PR.com)-- P.O.R. Products Inc. announces the establishment of a new business unit focusing on the Auto Refinish Market. The addition of this unit is a perfect complement to the Rust Preventive business and the POR-15® Brand. P.O.R. Products can now provide customers a complete solution for their automotive coating needs from primer to outer finish. The leadership of P.O.R. Products is excited to bring nearly a century of coating development and manufacturing experience to the Auto Refinish Market. This opportunity will allow P.O.R. Products to advance existing technologies and bring many new ideas to the market continuing the long practice of best in class product offerings. 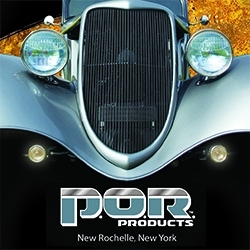 Decades of distribution and manufacturing experience gives P.O.R. Products the capability to deliver high performance, high quality products while maintaining strong business relationships with its customers. To lead the sales department of the new division, P.O.R. Products, Inc. is proud to welcome Craig Robatzek as its new Vice President of Sales – Refinish Division. Robatzek brings with him over 37 years of experience in application/sales training, product development, and brand building in the Automotive Refinish Coatings industry. In adding Robatzek as the Vice President of Sales, P.O.R. Products fortifies its commitment to product-category expansion through experience, vast knowledge and longstanding respect in the marketplace. On the technology front, P.O.R. Products Inc. is proud to add Christopher Diangelo to the team as Technical Manager. With over 22 years of Automotive Refinish experience, Diangelo has contributed to the developments and advancements in the formulation of Auto Refinish Systems and remains on the cutting edge of the industry's product development in a variety of technologies. Founded in 1923, P.O.R. Products, Inc. (formerly Absolute Coatings) is a third-generation family-owned manufacturing business located in Metro New York. With roots in shellac, then polyurethane floor coatings, P.O.R. Products has been committed to innovation and redefining quality through superior service and expertise. P.O.R. Products is a global supplier of industry leading performance coating products with its POR-15 Brand of products, and offers knowledgeable advice on product selection and technical support. P.O.R. Products and its associated brands will continue to evolve through research and development and grow its achievements in the industry.